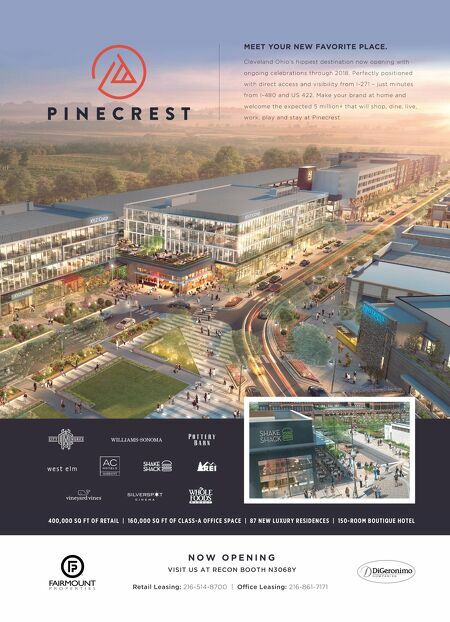 FOOD HALLS 118 • SHOPPING CENTER BUSINESS • May 2018 Careful consideration will be made to the development of the food hall. For starters, the roof is collapsing due to a fire two years ago. Wall Cos. has decided not to rebuild the roof, but remove the burned elements instead so that the de- sign keeps a "ruined look." A lot of char- acter can be maintained, says Wall, who points to large grain elevators as another design highlight of the project. TIME OUT MARKET Media and entertainment business Time Out Group has its own international line of food halls dubbed Time Out Mar- ket. The first opened in Lisbon, Portugal, in 2014. Chicago's Fulton Market District will be its fourth U.S. location, following Miami, New York City and Boston. Didier Souillat, CEO of Time Out Mar- ket, says he knew that Fulton Market was ready for food hall development when he visited the district about two years ago. "There are people starting to work and live there, and tourists are starting to visit because the food and beverage [scene] is so great," he says. Fulton Market is one of the oldest meat- packing and food distribution centers in Chicago, dating back to the 19th century. Realizing the area's potential revitaliza- tion, Google and McDonald's were ahead of the curve when they decided to move offices to the now trendy area. Slated to open in 2019, the three-story Time Out Market Chicago will encom- pass approximately 45,000 square feet. Plans call for 16 restaurants, three bars, 600 seats, a demo kitchen and terrace. The company's editorial team will help select the tenant lineup. In exchange for a share of revenue, Time Out Market provides tenants with kitchens, glassware and trays. Tenants are expected to supply pots and pans, two chefs and six menu items. Restaurants will have one-year contracts with Time Out Market, in order to keep offerings fresh and new. "Our concept is about keeping a pulse on the city," says Souillat. "Having a tenant for five years is way too long. You need to be able to move things around and have novelty for your concept." Another hallmark of a food hall's suc- cess is ensuring that it isn't just busy on the weekends. A location that truly works is busy at lunchtime on Mondays, according to Souillat. He says that in order to cre- ate a brisk business at lunch, a food hall needs "a great location and a big brand behind it." GALLEY EXPANSIONS Ben Mantica and Tyler Benson, found- ers of Galley Group Inc., have opened two food halls in Pittsburgh since 2015. The duo is now bringing its "incubator concept" to Cleveland and Detroit. Each location will be home to four restaurants, a standalone bar and outdoor patio space. They'll be open seven days a week. This fall in Detroit, Galley Group will open an 8,646-square-foot space at the Federal Reserve building, which is owned by Bedrock, a full-service real estate firm specializing in acquiring, developing, leas- ing, financing and managing commercial and residential buildings. The firm is part of the Quicken Loans family of compa- nies founded by billionaire Dan Gilbert. Chefs were able to submit applications to Galley Group for their restaurant ideas starting in March. By selecting non-estab- lished brands, Galley locations differ op- erationally from other food halls, accord- ing to Benson. "Our premise is that we give aspiring restaurants an opportunity to launch their concept for very low capital and low risk," he says. A typical food hall comes to fruition be- cause a developer is looking to add ame- nities to its property and ends up leasing the space to a third-party operator. 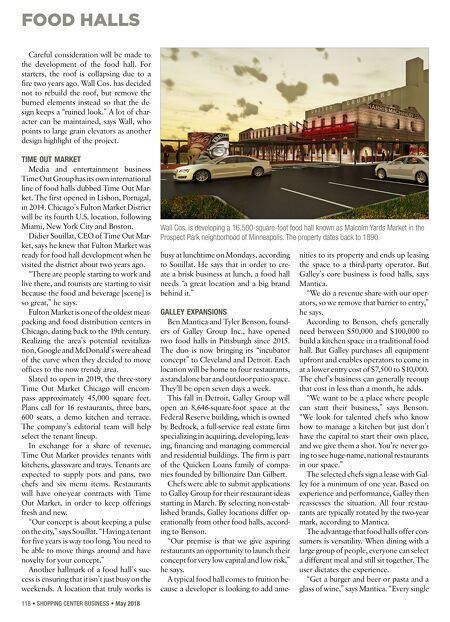 But Galley's core business is food halls, says Mantica. "We do a revenue share with our oper- ators, so we remove that barrier to entry," he says. According to Benson, chefs generally need between $50,000 and $100,000 to build a kitchen space in a traditional food hall. But Galley purchases all equipment upfront and enables operators to come in at a lower entry cost of $7,500 to $10,000. The chef's business can generally recoup that cost in less than a month, he adds. "We want to be a place where people can start their business," says Benson. "We look for talented chefs who know how to manage a kitchen but just don't have the capital to start their own place, and we give them a shot. You're never go- ing to see huge-name, national restaurants in our space." The selected chefs sign a lease with Gal- ley for a minimum of one year. Based on experience and performance, Galley then reassesses the situation. All four restau- rants are typically rotated by the two-year mark, according to Mantica. The advantage that food halls offer con- sumers is versatility. When dining with a large group of people, everyone can select a different meal and still sit together. The user dictates the experience. "Get a burger and beer or pasta and a glass of wine," says Mantica. "Every single Wall Cos. is developing a 16,500-square-foot food hall known as Malcolm Yards Market in the Prospect Park neighborhood of Minneapolis. The property dates back to 1890.